It’s half way through April now and you’re wondering why has my child care rebate stopped? Aha. Hands up who has maxed out their $7,500 Childcare rebate? But you’re doing the happy dance now that the new laws have gotten rid of the $7,500 Cap? Yes? That doesn’t start until 1 July 2018 which means that you have an ENTIRE financial year to go until we move onto the new Childcare Subsidy from the system we have now. So it’s full fees for some of us now until 30 June. Did you know that if you also receive the Childcare Benefit, Centrelink actually withholds the final 15% of your $7,500 until you submit your tax return after 30 June? That means that you stop receiving the Childcare Rebate each financial year when you reach a cap of $6,375 and the remaining $1,125 may or may not be refunded with your tax return. Well it does make sense from Centrelinks’ point of view. The amount you receive for Childcare Benefit is based on an estimate you make at the start of the year of how much you think you will earn. If you underestimate, Centrelink will overpay you during the year and they will want their money back. They get their money back from the $1,125 that they hold back. The only way they know if you have been overpaid is when you do your tax return. Then your estimate becomes the actual and they know for sure if you have been overpaid – or hopefully underpaid. I have a task for you this week. Get the statements you receive from your childcare centre. At the very bottom of your statement it will tell you how much of Childcare Rebate you have received this year. Make sure it’s what you expect it to be and that it matches the balance from Centrelink. The reason I want you to do this is because of something that happened to me last month. I don’t receive the Childcare Benefit. When I applied all the way back in 2011, I ticked the box that said I wanted a percentage of 0%. There was never EVER going to be a chance of any over payment by doing that. I’m an accountant – it’s my job to be conservative! So when I stopped receiving my Childcare Rebate last month I checked my statement from childcare and it said that I had received $6,375. This didn’t seem right to me as I know the last 15% shouldn’t be withheld from me as I don’t receive the Childcare Benefit. Then I checked the Centrelink App which showed that in the previous week I had been allocated to receive Childcare Rebate, however on the statement from my childcare centre, it had not been applied. There was a mismatch and it was costing me money! The issue turned out to be in the software that the childcare centre uses and it was all fixed and I received a credit. The reason that I want you to do this double check is that according to Centrelink I had received the money, but it was not being passed on to me by the centre. As a result, when all the year end balances will be done with my tax return it will not be refunded to me and I would have been out of pocket forever. It’s tips similar to this one that are included all throughout my instruction manual Your Family Budget. 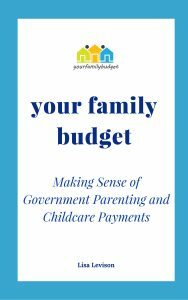 I don’t just tell you what to do and what it all means, but more than that, I actually give you information that makes it relevant for your situation, whether you are applying for Paid Parental leave or Childcare Payments. Save yourself the stress and the wasted hours of time and download Your Family Budget today. I am grateful to you for helping to navigate the mine fields that are this centrelink!